October 21, 2016 – The Red Spider Planetary Nebula shows the complex structure that can result when a normal star ejects its outer gases and becomes a white dwarf star. Officially tagged NGC 6537, this two-lobed symmetric planetary nebula houses one of the hottest white dwarf stars ever observed, probably as part of a binary star system. Internal winds emanating from the central stars have been measured in excess of 1000 kilometers per second. These powerful stellar winds generate waves 100 billion kilometers (62.4 billion miles) high. The winds expand the nebula, flow along the nebula’s walls, and cause waves of hot gas and dust to collide. Atoms caught in these colliding shocks radiate light. 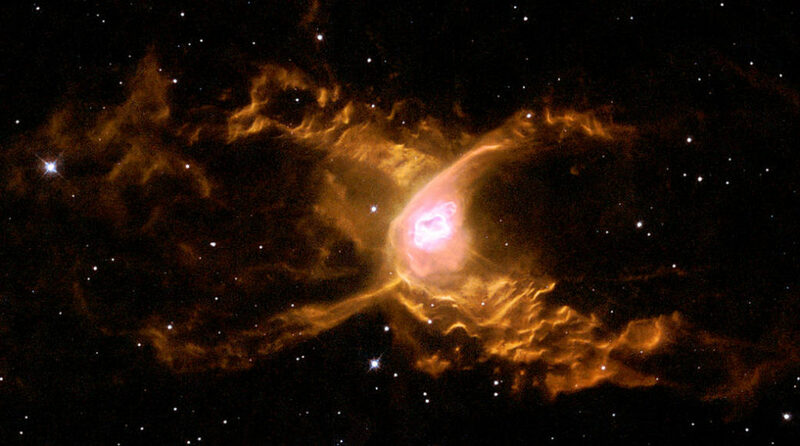 The Red Spider Nebula is located some 3,000 light years away in the constellation of Sagittarius.